At Palau Community College, researchers continue to improve their larval rearing of rabbitfish under the project “Improving Rabbitfish Seed Production Capacity in Palau.” During the most recent reporting period, PCC developed an easier way of collecting eggs and established more effective intubation of eggs. They have also improved survival by establishing a better protocol for rotifer larval feeding, and now feed with rotifers up to 21 days. The research team has had to mitigate a parasite outbreak at day 15 due to pressure in the water filter bag, which caused mass mortality - they now treat the water and have experienced less of a challenge. During the project conference call, the PI advised that he will implement ideas to continue improving survival rate (currently at 10%, up from 1.5%). Currently, aside from 73,000 fry, there are also about 12,000 fingerlings (total length-1 inch) that are being reared in the nursery tanks at the PCC hatchery. These fingerlings will be ready for distribution to new farms this summer. 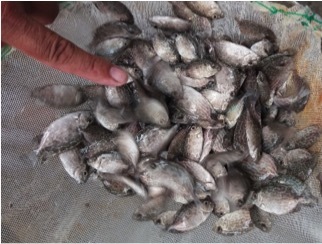 As of June 2018, about 7,500 rabbitfish (Siganus lineatus) juveniles have been delivered to a five newly established rabbitfish floating cage farms located in the States of Koror, Ngiwal and Melekeok. Aside from providing free rabbitfish juveniles to farmers, PCC-CRE also provides technical assistance by giving advice on proper husbandry, feeding management and monitoring of environmental parameters in their farms. 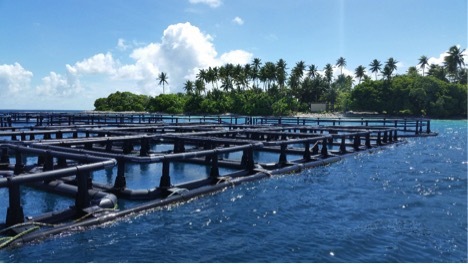 In the Marshall Islands, the project “Development of Marine Finfish Aquaculture, Aquatic Feeds, and Training in the Republic of Marshall Islands (RMI) for Sustainability and Food Security,” now in its third year, is also focusing on aquaculture of rabbitfish. 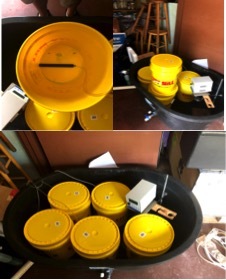 The lead researcher is continuing his efforts to achieve a successful hatchery trial on Rabbitfish, and is currently collecting and conditioning additional broodstock for this purpose. The existing broodstock is producing eggs on a monthly cycle. At the time of the project conference call, the group was expecting a new batch of eggs and the ability to restock the cages in 45 days. The goal is to stock the cages to conduct a growout trial, beginning later this summer. To date, two farmers have agreed to be in charge of the production cages, and the project is still looking for two additional farmers to assist. The farmers are responsible for all maintenance of the 15x15x10 cages stocked with 1,400 juveniles, while Ryan provides them with the fish and feed. If the farmers in charge of the cages do well, they will be given a portion of the fish and the opportunity to manage a larger cage. During the project update conference call, the lead researcher shared that the vision for this phase of the project is for both ATMI and private farmers to take over the facilities once CTSA funding support comes to a completion. A joint project between the University of Hawaii and Oceanic Institute of HPU continues to investigate the “Utilization of local agri-processing by-products to produce fungal protein for aquatic feed production.” The UH research team has successfully scaled up production of the fungal biomass to 20L bioreactor scale, and is currently designing a total-capacity 50L bioreactor utilizing 5 different 10L vessels simultaneously. At the onset of the project, researchers were focused on using molasses as a substrate. However, the closure of Hawaiian Commercial & Sugar Co. has forced the research group to investigate other local agriculture byproducts that could be used. They are currently using commercially available molasses but the growth characteristics of fungal biomass have changed drastically. In a 2.5L bioreactor, the production rate has dropped six-fold and in a 20L bioreactor, the drop has been tenfold. The researchers will need to find a more suitable medium—such as okara, soy whey, vinasse, or beer waste—from local sources to maintain stable fungal biomass medium. The UH lab is now looking into using waste from tofu production (which is available in abundance), and advised during the project conference call that they have begun testing fungal production with soya whey. The yield has been an average of 29 g/L vs. the 10 g/L yield achieved with molasses. The lab will look into brewery waste next, and sweet potato is another potential that has not yet been investigated. According to analysis from OI, the fungal biomass ingredient has sufficient protein at 40% (although the most recent samples only contained 20% protein). A shrimp digestibility trial will take place in Fall 2018 once the UH team has been able to produce a sufficient amount of the biomass for inclusion in feed formulations.